The vessel was said to be transporting gold, silver and precious gems collected in the South American colonies to be shipped to Spain's King Philip V to help finance the war of Spanish succession. Colombia said it first discovered the wreck, located somewhere off the coast of Cartagena, in 2015. So, who has the rights to a shipwreck? There are international agreements that have rules for some parts of the treasure-hunting process. However, the decision of who is entitled to keep the contents of a valuable vessel tends to end up being made between countries under international law, says Robert Mackintosh, a lawyer and archaeologist at Southampton University. "It's a very complex picture, as a lot of states and people can have a lot of different and often competing interests in wrecks, interests which have their origins in various different bodies of law," he said. For example, the ship's original owner has a viable right to ownership. But that right can be superseded by the country which owns the national waters in which the ship was discovered. "The ocean is the world's greatest museum," says marine archaeologist Peter Campbell. And hunting for treasure on sunken ships is big business. Speculation about the value of the contents of a wreck can skyrocket even before items have been removed. But often the operational costs of the archaeological investigation can be higher than the value of the wreck itself, says Mr Campbell. News reports suggest the contents of the San Jose might be worth up to $17bn (£12.7bn). Although when the Colombian government went public with the discovery in 2015, the estimated value of the treasure reported was between $1bn and $10bn. That $17bn figure "seems to have been plucked out of the air", says Mr Campbell. Even so, experts agree that the San Jose has immense financial and cultural value. The 2001 Unesco convention on underwater cultural heritage includes rules to help guide best practice for underwater excavations and guidelines regarding the qualifications required for people involved in conservation and site management. The part of Unesco that oversees underwater heritage sites told the BBC it would be delighted to play a role settling claims over shipwrecks. However, it says it has not been approached to act in that capacity. A country may claim ownership of a wreck if it owned the ship in the first place. Even if a vessel was sunk and abandoned for hundreds of years the original owner can still claim ownership rights. There have also been cases of a country transferring ownership of the ship to another country for the vessel to be displayed in a museum. However, ownership can be complicated by the location of the wreck if it lies in the territorial waters of another state. Under international law, a country has complete sovereignty over these waters and so essentially can do what it wants in terms of taking ownership, says Mr Mackintosh. There are further legal ramifications if the wreck lies in international waters. When a ship has been discovered, the country where the ship was registered can point to something called sovereign immunity (in addition to claims of ownership). This refers to a specific category of ships that are immune from legal proceedings by another state. Warships and other government ships operated for non-commercial purposes enjoy sovereign immunity, says Mr Mackintosh. 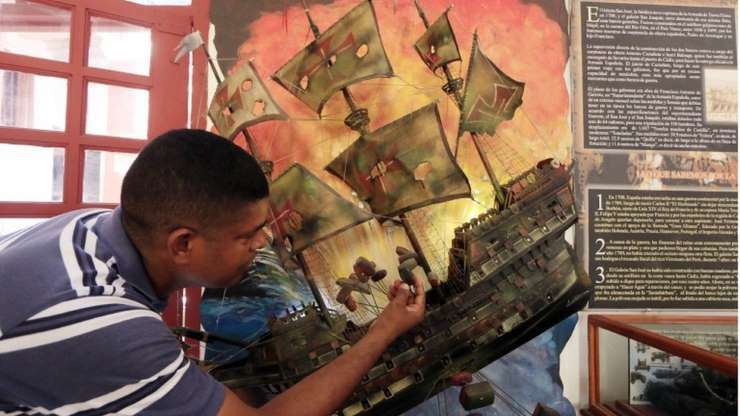 Under the sovereign immunity principle in 2009, a judge in the US ruled the court lacked jurisdiction over a case involving a treasure hunting company called Odyssey Marine Exploration and the wreck of the Spanish ship the Nuestra Senora de las Mercedes. The US company was ordered to give half a million gold and silver coins to the government of Spain. The company had unearthed the 17 tonnes of coins off the coast of Gibraltar and transported them to the US. Odyssey said they found the wreck in international waters and claimed salvage rights. Spain said it had never relinquished ownership of the ship's cargo and the coins were part of the country's national heritage. The origins of contents of a ship may also be disputed. For example, in the case involving Odyssey and the Mercedes shipwreck, Peru submitted claims to US courts that stated that the origin of the precious cargo was Peru where the coins were mined and minted while it was part of the Spanish empire. World - U.S. Daily News: Reality Check: Who owns treasure hidden under the sea?